Offering 52 educational activities that develop fine motor skills and inspire STEAM (science, technology, engineering, art, and math) learning, Busy Bags Kids Will Love teaches you how to achieve that much-needed quiet time without the guilt. Best of all, you don’t have to break the piggy bank for these easily affordable, colorfully delightful crafting projects. 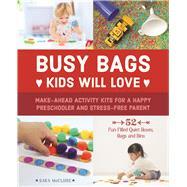 This book offers a multitude of diverse activities for developing toddlers. Each one unlocks your preschooler's ever growing cognitive sensory functions: touch, sight, hearing, and smell. Crafts like ABC sticker puzzles, silly straws, button flowers, and build a robot make for fun quiet time while brightening the toddler’s day! The book’s 52 ideas are the perfect indoor and outdoor treat for birthdays, holidays, and everyday playtime come rain or shine. Sara McClure is a mom and certified teacher with experience in early childhood education. She holds a bachelor’s degree in Child and Family Studies with an emphasis on Early Childhood Education for grades preK-4 and a master’s degree in Urban Education. After five years of classroom teaching she transitioned to homeschooling her two boys. To save her sanity, she uses busy bags to keep her younger son entertained while she teaches the older son. She is the blogger at HappyBrownHouse.com where she shares meaningful learning activities for kids, recipes, and a peek into her homeschooling life.